The Centers for Japanese Studies and Buddhist Studies at the University of California, Berkeley, together with Ōtani University and Ryūkoku University in Kyoto announce a workshop under the supervision of Mark Blum that will focus on critically examining premodern and modern hermeneutics of the Tannishō, a core text of the Shin sect of Buddhism, and arguably the most well-read religious text in postwar Japan. 2018 will be the second year in this five-year project that meets twice each year: we will meet in Berkeley from March 2 to 4 and in Kyoto at Ryūkoku University from June 22 to 24. Organized around close readings of the most influential materials produced in early modern, modern, and postmodern Japan, the workshop aims at producing a critical, annotated translation detailing the salient ways in which this text has been both inspirational and controversial, as well as a series of essays analyzing a wide spectrum of voices in Japanese scholarship and preaching that have spoken on this work. For the early modern or Edo period, the commentaries by Enchi (1662), Jukoku (1740), Jinrei (1808), and Ryōshō (1841) will be examined. 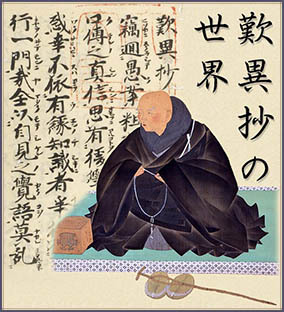 For the modern period, works by Andō Shūichi (1909), Chikazumi Jōkan (1930), and Soga Ryōjin (1947) will be the major concern. And for the postwar/postmodern period, due to the sheer volume of publications (over 300 titles), reading choices will be selected at a later date in consultation with participants. Format: The language of instruction will be primarily English with only minimal Japanese spoken as needed, and while the texts will be in primarily in Classical Japanese and Modern Japanese, with some outside materials in kanbun and English. Participants will be expected to prepare the assigned readings, and on occasion make relevant presentations in English about content. Dates: Exact dates will vary from year to year based on academic calendars, but for 2018 the meeting hosted by U.C. Berkeley will take place from the 2nd to the 4th of March at the Jōdo Shinshū Center in Berkeley, and in Kyoto the seminar will be hosted by Ryūkoku University from the 22nd to the 24th of June. Cost: There is no participation fee, but in recognition of the distance some will have to travel to attend, a limited number of travel fellowships will be provided to qualified graduate students, based on preparedness, need, and commitment to the project. Participation Requirements: Although any qualified applicant will be welcome to register, graduate students will be particularly welcome and the only recipients of financial assistance in the form of travel fellowships. Affiliation with one of the three hosting universities is not required. We welcome the participation of graduate students outside of Japan with some reading ability in Modern and Classical Japanese and familiarity with Buddhist thought and culture as well as native-speaking Japanese graduate students with a scholarly interest in Buddhism. Although we welcome students attending both meetings each year, participation in only one is acceptable. Application Procedure: Applications must be sent for each year that one wants to participate. To apply to register for either or both of the workshops for 2018, send C.V. and short letter explaining your qualifications, motivations, and objectives to Kumi Hadler at cjs@berkeley.edu by the end of January, 2018. Applications are by email only, and application deadlines will remain as end-January in subsequent years as well. Requests for a travel fellowship money should be included in this letter with specifics of where you will be traveling from and if you plan to attend one or both meetings that year. Questions about the content of the workshop may be sent to Professor Blum at mblum@berkeley.edu. Communication regarding the Kyoto meeting may be sent to Karasawa Taisuke at karasawa-taisuke@ad.ryukoku.ac.jp.